I’ve gotten more than a few questions over the last year on how to use the ASP.NET MVC framework and the Web API framework together. Do they work together? Should they work together? When should you use one or the other? Here’s some general rules of thumb I use. One thing to keep in mind is that the Web API is a separate framework with its own dependency resolver, action filters, routing rules, model binding, and model serialization settings. Bringing in a 2nd set of all these components just to satisfy a few JSON requests from script is an increase in complexity. Although the Web API does add some complexity, it is also easier to build a proper service with the Web API. I can use the verb based routing and content negotiation features to build services oriented around resources, and the OData support and automatic help page generation of the Web API framework can come in handy. 3. I’m not a big fan of services for services sake. 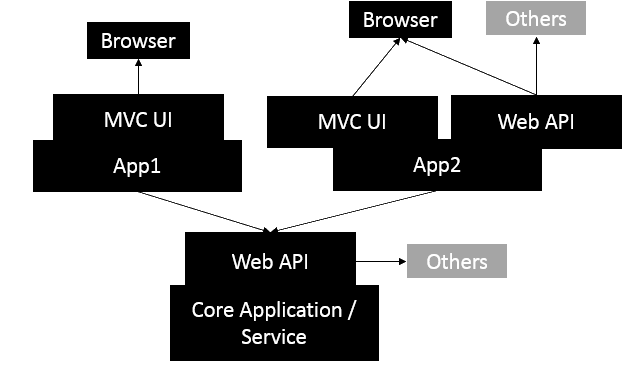 In the previous two figures, the MVC UI and Web API pieces are drawn to suggest how they are only facades on top of a core application. 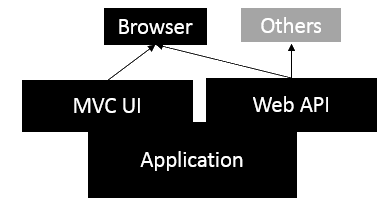 Most of the interesting things are defined in the application and not in the UI and Web API layers. When someone suggests that the MVC controllers should talk over HTTP to Web API controllers in the same application, all I can think about is putting a façade over a façade, which seems silly. There are some valid reasons to go with such an architecture (see #4), but be cautious when creating new tiers. 4. It is more than reasonable to integrate multiple applications or large pieces of functionality using services and the Web API. 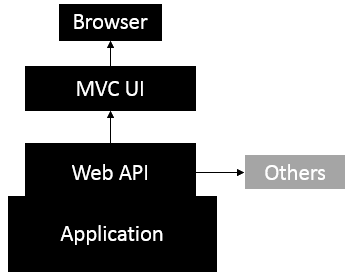 This is a scenario where having web service calls inside or behind the MVC controllers of an application is almost required. The above type of scenario usually involves large applications and multiple teams. Using a service layer allows for more flexibility and scale compared to sharing binaries, or integrating at the database level (shudder with fear). 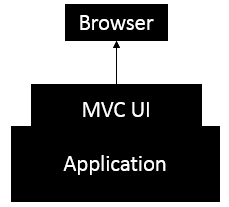 How about MVC just for view rendering and then all the calls for JSON goes to WebAPI? @Harris: Yes, scenario 1 or 2, depending on how much you have to expose with JSON. It's a judgement call. Thanks for your comments on #3. I think that pattern is used way too often without justification. Very nice analysis! I understand that this post is about the coexistence of ASP.NET MVC and WebAPI but in some cases I have completely eliminated ASP.NET MVC and use only the WebApi with an initial index.html as a SPA. I don't think it helps much that the default template for MVC4 includes both a MVC site and a web API endpoint. This also changes a bit for vNext -- it seems the new unified ASP.NET will handle this better though I didn't get time to get into the details. Slightly off topic, but what would be your thoughts on a Web Forms application that makes little use of server controls but is heavy on jquery ajax calls returning json by way of: (1) Web API, or option (2) page methods in code behind? @Matt: re Web Forms & jquery ajax FWIW, I use a WCF (ASP.NET compatible) endpoint since I'm weird like that (and on .NET 3.5).